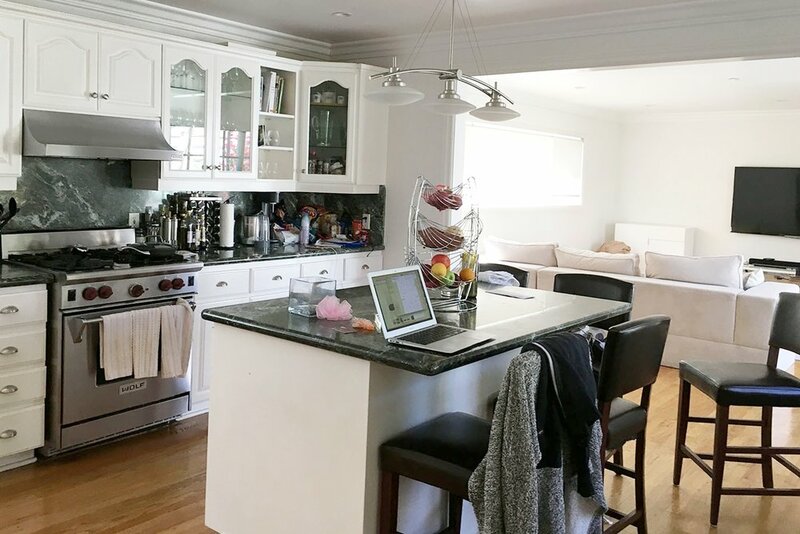 Inspired by Christine Flynn's framed photography print, "McWay Falls", we gave this kitchen a fresh and modern update with just a few simple changes and accessories. Using the Big Sur print as our guide, we mixed shades of gray, blue and green with wood elements to create this laid-back coastal California vibe. The most dramatic change we made in the space was replacing the island pendant light with one that felt more modern. This fun 9-light pendant pairs bubble glass balls with polished chrome for a look that totally channels the ocean (jelly fish anyone?). Next up we swapped out the dark and dated barstools with stools outfitted in salt and pepper tweed upholstery with a polished nickel finish. The light gray fabric keeps the kitchen feeling light and airy, while offering a comfortable place to gather around the island (yet another opportunity for a beach pun). The homeowners loves to host so we added additional seating by placing a teak wood bench under the large double windows and topped it off with two lumbar pillows in a striped mud cloth fabric. The blue tones in the pillows add a punch of color as well as keeping with the beachy feeling in the room (they're nice and comfy too!). We brought in a few more wood elements by layering cutting boards on the counter top for easy access and adding a wood tray to the island. A white jute runner rug adds texture and brightness and an oyster printed tea towel adds a bit of ocean inspired whimsy. Finally, we completed the look with fresh flowers and potted plants.